In the Victorian and Edwardian eras, many local councils were creating new parks for people to spend their leisure time. Heavitree Urban District Council opened the Pleasure Ground in 1906, "to clear rowdy youths" from Fore Street in the evenings. The Council purchased the land at the end of 1905, for £3,100 and, the first phase, a children's playground was opened on 1st May 1906 by Colonel Vaughan in front of 800 children, and as was common for the time, God Save the King was sung. In 1907, the bowling green and tennis courts were completed. The area was enlarged in 1908, when the remaining hedges were removed and a field reserved for the Football Club. F W Meyer of the Exeter nursery, Veitch's designed and landscaped the grounds, and a ground-keeper employed for 24 shillings (£1.20) per week to maintain 11 acres of park. There are some magnificent trees in the Pleasure Ground, some of which were planted for the coronation of George V and Queen Mary in May 1911. A cast iron plaque was placed in front of the Coronation oak by J R Nethercott JP, chairman of the Heavitree Urban District Council, but disappeared after many years. When David Morrish, a local councillor noticed it had gone, he spoke to the park keeper who said that it must be the old plaque on a top shelf in the store. The plaque was restored and put back in front of the oak. In July 2009, Kath Haddon was walking her children to school through the Pleasure Ground by the Coronation Oak when it suddenly split in two on a stormy morning. She said "I heard this enormous creaking sound. I can't say how long it lasted, it seemed like it was happening in slow motion... I just moved by about two metres and watched the tree crack down the middle where we were." A Council spokesman said that the crown of the tree will be reduced and that it would survive for another 98 years. By 1939, the Pleasure Ground had been extended to 19 acres, with three hard tennis courts and a 'children's nursery ground'. On 5th May 2006, Cllr Morrish and the Lord Mayor of Exeter, Cllr Peter Wadham attended a celebration for the centenary of the opening of Heavitree Pleasure Park. Local children, dressed in Edwardian clothes, sang period songs and danced around a Maypole. They then followed an accordian player down to the entrance of the park to attend the unveiling of an obelisk remembering the event. The Lord Mayor then unveiled the obelisk, and after, the children attended a tea party in the park. New additions to the Pleasure Ground include a basketball court and picnic area. On the south side of Fore Street, off Butts Road can be found the smaller Heavitree Park. Containing some mature trees, the park has some historic boundary walls. There are some interesting villas in Heavitree Park, indicating that the park was originally a common pleasure ground for the inhabitants. Sources: Heavitree by Trevor Falla, a David Morrish guided walk and the Express and Echo. 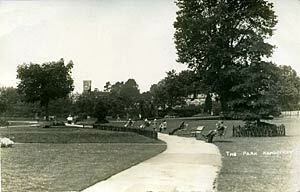 The Heavitree Pleasure Ground in 1935. 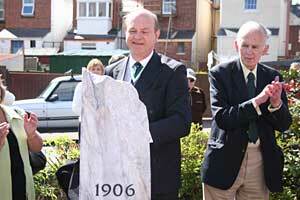 The Centenary of the Heavitree Pleasure Ground with the Lord Mayor. 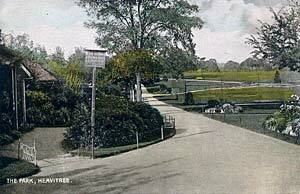 Heavitree Park in earlier times.